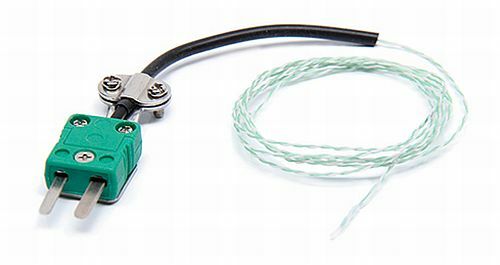 It is ideal for repetitive jobs since the system is able to run a specific temperature profile without the need of a thermocouple. JBC offers you 3 predefined temperature profiles and 10 more to personalize. Using the console you can select the mode of operation: by power or by temperature. The Heater Unit works with 1 or 2 heating zones and the PCB Support has 3 adjustable heights. Especially designed for working with the PHS IR Preheater, it allows adjustment for different heights and positions depending on the operator’s needs. This means it can cover the whole working area. The arm can be placed in different positions, affording great flexibility when working on rework projects. Thanks to the multiple arm joints the height of the arm can be adjusted to suit all components whatever their size. 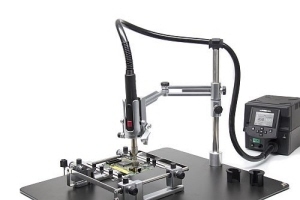 It provides full access to the whole work area by fixing the position of the arm joints using the tightening knobs. This holds the hose away from the work area to keep it clear of obstacles. 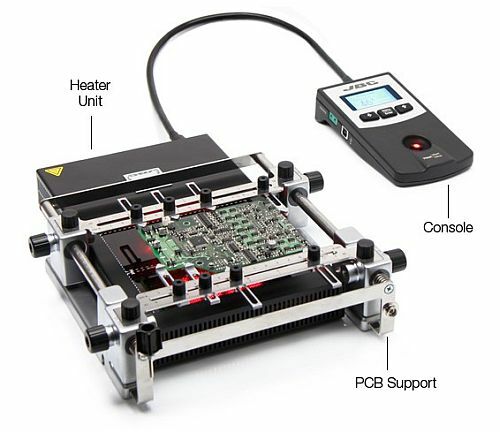 The most complete solution to preheating large PCBs. 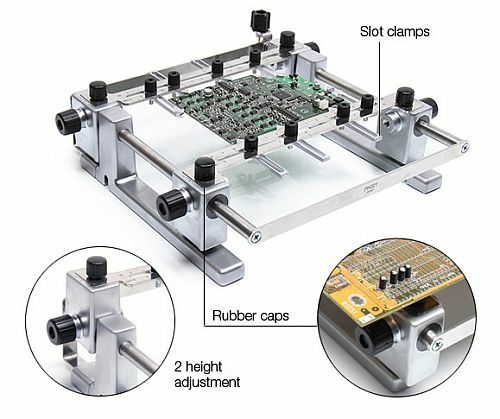 Essential for soldering on multilayered boards. It supports the Hot Air heater and leaves the operator free. Especially designed for working with the PHB Convection Preheater. Once the arm has been fixed into position and the work profile has been set (temperature, air flow and time) in the Hot Air stations, the arm means you can fix the tool in place for when you need to repeat the operation for the same batch of PCBs. 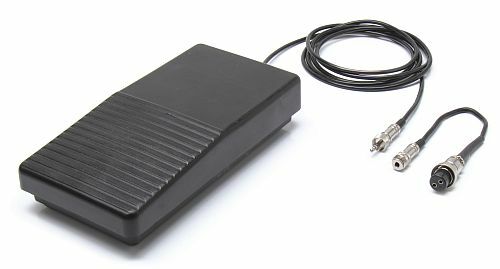 This support is perfectly adapted to any type of PCB by means of its many adjustable parts. 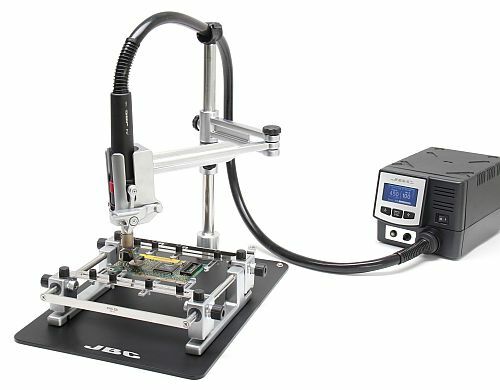 It allows you to properly position PCBs of the same batch so as to always heat the same area. This means you save time and optimize workflow. The PHS-SA incorporates several slots for a total alignment to the PHS-B IR Preheater system. The user can modify the height of the support (75 mm or 95 mm) according to the working needs. 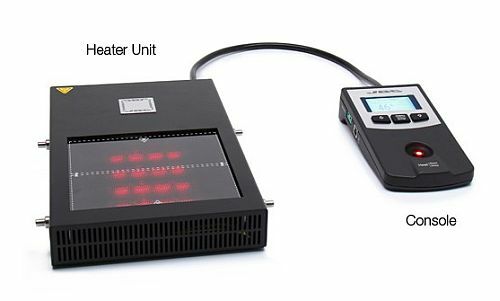 The type K Thermocouple works with the PH Infrared Preheater. It allows you to monitor and control the temperature on a specific point of the PCB.